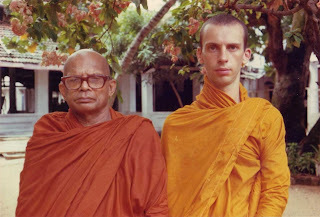 After several years of wandering around India I ordained as a samanera at Sravasti in 1976 with Venerable Matiwella Sangharatana who had been general secretary of the Mahabodhi Society at Sarnath for many years. Although Ven. Sangharatana had been educated at Shantinekatam by Rabindranath Tagor, was proficient in Sanskrit and could speak fluently in Pali, he was not a scholar by disposition but rather a practical man, a doer. But his most pronounced characteristic was his intense and total dedication to the Triple Gem, a characteristic I hope I inherited from him. Ven. Sangharatana passed away on the 31st December 1983. This is him and me in 1976. Goodness, I was thin in those days! There was chronic food shortages in India in the 70’s and we didn’t have that much to eat. 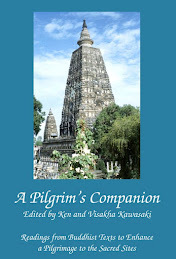 Later I went to Sri Lanka and lived there for nearly ten years. 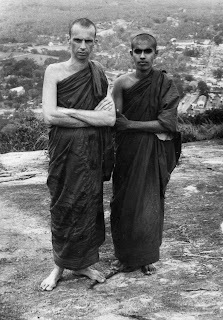 During my early years in Sri Lanka I went through an ‘ascetic’ phase – using no money, eating only what I begged for, living in caves, wearing no sandals, etc. This is me with Kushan Manjusri, son of the famous painter Manjusri. At one time Kushan and I shared a cave and went carika together. 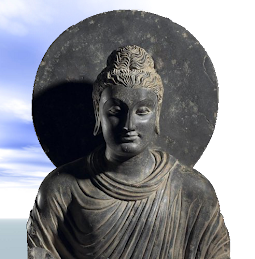 Kushan later disrobed and went on to become a renowned painter himself. Later he had problems with depression and died fairly young just a few years back. We met for the last time at the 100 anniversary celebrations of Manjusri's birth. 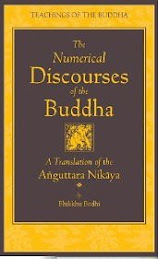 Amongst the people I got to know in Sri Lanka was Mr. Richard Abhayasekera and Venerable Nyanaponika of the Buddhist Publication Society in Kandy. This is me, Ven. Nyanaponika, Ven. 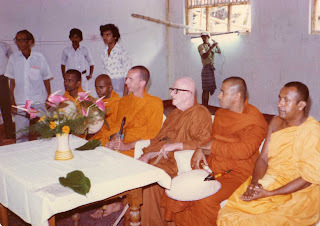 Sumana and several other monks at the opening of the new BPS headquarters in 1983 ? Here is me examining a very old palm leaf book at the majestic Lankatilaka Maharaja Vihara in Gampola. I love your photo album and commentary. More! 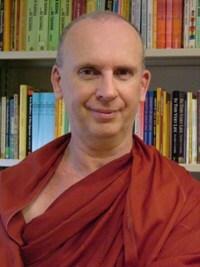 Bhante, it is wonderful to see your photos and hear a bit of your life story. Many thanks. I enjoyed seeing your old photos. Even though I've heard about some of your travels in your talks, etc., seeing the photos brings to mind more strongly both the hardships and rewards of those kinds of travels. 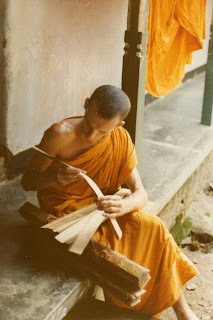 In the photo of you in Thailand and those as a young monk, you look very serious and focused. There's not really a hint of your wry humour and sense of the absurd. Was that with you also back then? Wishing you and your blog readers a happy and healthy 2010! 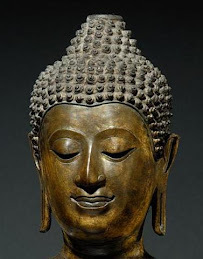 Kushan Manjusri is happy, well and even alive as I write this seated right next to me! I have just read your comment on my blog. I am absolutely delighted that Kushan has not gone to the next world and rather annoyed at the informant who had told me he had. Wish him good health on my behalf.